It's been a long and exhausting but ultimately very satisfying day today. Two of my friends are here from England to visit for a couple of days so I was at the airport at 7.30 this morning to pick them up after their flight from Madrid. Having been kept awake until early morning by partying neighbours this was not an easy task but good strong Spanish coffee made the job that much easier. We picked up a hire car and after dropping things off at my flat we headed out for the coast, my first real excursion in Galicia (I'm a little ashamed to say it's taken me so long to do this!). We took the car to Muros to the West of Santiago where we stopped off for another caffeine hit and walked along the extremely pleasent harbour front, while the not so pleasant political vans went past, urging us to vote for the various candidates in this month's general elections. The journey from Santiago to Muros is very pleasant with lush green hillsides - unlike most of Spain which is in general very arid. However, this area is known mostly for its spectacular Atlantic coastline, and indeed it is stunning. 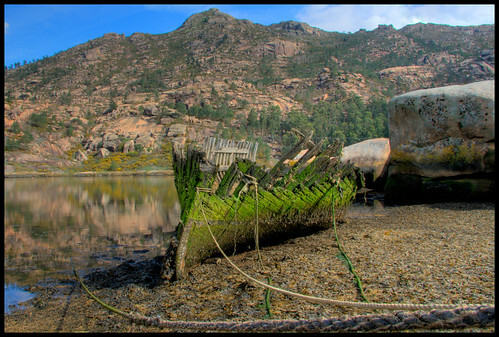 From Muros, North, up the Coast of Death to Fisterra (the end of the world, though a different end of the world from Finistere) takes you on winding roads past beautiful, isolated beaches and small towns with fishing and agriculture still the main source of income. We stopped along the way in a local bar for lunch and rather confused the very accommodating boss with a request for a vegetarian option. After he waved a piece of beef in our direction and we suggested that probably wouldn't fit the bill he nodded, smiled, walked around the corner and came back with a bucket full of octopus which he cooked up specially. Not wishing to seem rude the two non-vegetarians ended up gorging on beef, pork and octopus while the veggie had nothing but a few nibbles. Getting to Fisterra I was a little worried that we would be met with the same sort of theme park which resides in Land's End, the most Westerly point of the Southern mainland of Great Britain. In England it is a candy floss drenched amusement park of the most sickly, exploitative proportions. Somewhere which should somehow feel isolated simply feels like a gaudy playground full of cheap shops and coin machines. Anyway, Fisterra is much more underplayed and consequently more pleasant. 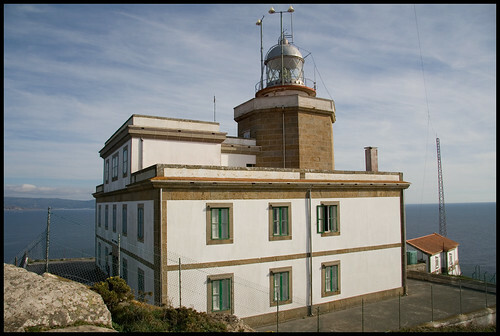 The density of people is not much lower but, apart from the cafe, the lighthouse itself and the panoramic view of the Atlantic ocean are the only attractions. Anyway, it's been a spectacular day, after an atmospheric start with low clouds we were left with bright blue skies and all returned wind-swept and exhausted but definitely pleased to have made the effort. Believe it or not the above photo had virtually no editing done to it (just sharpened up a notch). I'm not sure why it has come out looking slightly unreal but anyway, the lighthouse at the end of the world is well worth a trip. You mention not many attractions, who needs them anyway - when you have blue skies and octopus. 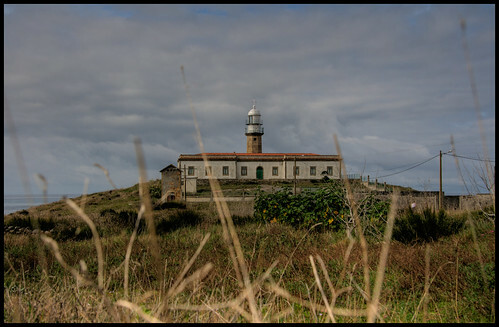 Jon, nice lighthouse photo, but what makes you think it seems "slightly unreal" (if it's possible to explain...)? Biscuit - your mention of Land's End reminds me. Did you read about the Scot how's just cycled around the World and shaved a whopping 3 months off the world record. Averaging 100miles a day for just under 200 days. Turns out he's a guy i did my first ski season with. The guy's got guts. Perhaps it didn't look quite as crisp as the photo has come out when I was actually there. Somehow the photo seems even more real than the real thing. Not sure why that would be. ACYHC - I did indeed read about that. I bet his paneers didn't have as much rubbish as ours did though, and frankly I bet if Bailey hadn't had his arctic, Asda own sleeping bag we would have made twice the distance in half the time.